Ten-year-old Victoria Sparks didn’t know exactly what she wanted to be when she grew up, but it was between Supreme Court justice and cardiothoracic surgeon. Or, if you caught her on another day in which she had searched the Internet for professions with impressive-sounding names, she might have given a different answer. If the job title dazzled the adults, she committed it to memory. Ever since she was a child, Sparks feared mediocrity. She says she was never content with not being great. Years later, Sparks 18L is graduating from Emory University School of Law with a juris doctor and a position at a law firm in the pipeline — an enviable accomplishment, even for a girl who was in no danger of ever being mediocre. Sparks’ mother is an attorney, but that initially did nothing to sway the younger Sparks toward the profession. As a child, she assumed that all lawyers did was paperwork. Her mother, the high school mock trial coach, had her attend a practice and serve as a witness. It piqued her interest, so, as usual, she went all-in. She attended law camp the summer after 10th grade and continued doing mock trial competitions in college. “I liked the intellectual challenge it gave me, having to grapple with complex legal issues and reason my way in and out of predicaments,” she says. Her freshman year, she went to a competition at which her competition was so cutthroat she decided she wanted no parts of the law after all. She turned her focus to numbers. After an education in economics and a corresponding pre-PhD program, she planned to move forward in a related career — but Eric Garner was tragically killed by a police chokehold while selling cigarettes outside a convenience store. Protests proliferated on her college campus. Devastated by the news surrounding this fatal arrest-gone-wrong, Sparks considered how she could participate in the fight against police brutality. That’s when she recognized the true potential attorneys possess. She took the LSAT and decided to apply to law schools. 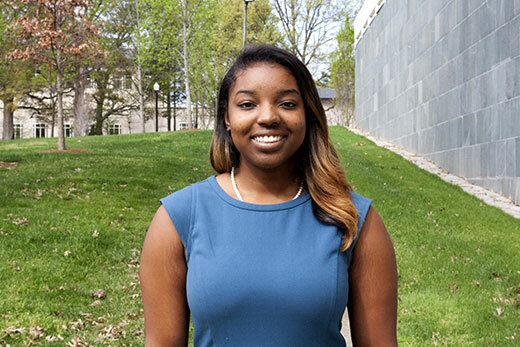 After a short time at Emory, Sparks developed an interest in real estate law, but was conflicted, fighting a feeling that she’d be a “sell out” for not helping communities of color by becoming a civil rights attorney. In Sparks’ last year at Emory, another icon would confirm that sentiment. United States Supreme Court Associate Justice Sonia Sotomayor visited Emory Law in February 2018, and Sparks was unexpectedly seated next to her at a private brunch that preceded her public talk. Sparks, who has accepted a job as an associate with Atlanta’s Eversheds Sutherland, accomplished so much while at Emory: symposium editor for Emory International Law Review, president of Emory Black Law Students Association, and recipient of the Delores P. Eldridge Commitment to Diversity Award and the Excellence in Leadership Award in 2017. It was never her intent, though, to be top of her class. She wanted to experience law school deeply, and she believed that would preclude her from being number one — and she was OK with that. She was not OK with being average though, and, without doubt, she is not. Ethan Rosenzweig, senior assistant dean for Admission, Financial Aid, and Student Life, agrees: “Victoria personifies our aspirations for the Emory Law student experience. She arrived with a broad idea of how she could use her gifts to better the legal field. Her mother couldn’t be prouder.